Position Technology improves the ergonomic human/human interface for dental care by placing the operator behind the head of a patient that assumes a nearly horizontal position. This full rest position relaxes patients as they are familiar with a horizontal positon while sleeping. EEG recordings have confirmed this. 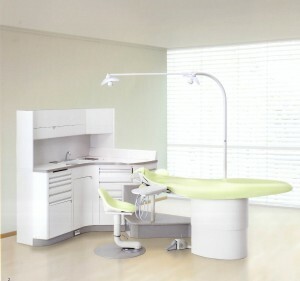 In addition, the patient support becomes a DENTAL UNIT by integrating the Treatment Technology without arms or positioning devices as close as possible next to the mouth of the patient. The position of the operator behind the patient instead of beside the patient as encouraged by tilting dental chairs allows better access for fingers to control contacts on oral tissues, instruments, and handpieces in the mouths of patients. In addition, the direct and indirect views of oral tissues are improved as is the vector control of finger movements. 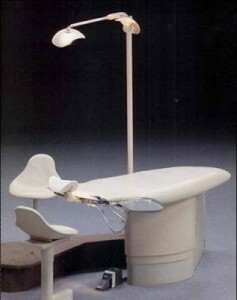 The first DENTAL UNIT was manufactured by the Morita Corporation, Kyoto, Japan in 1964. 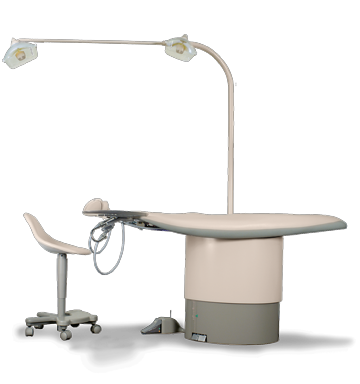 Morita now manufactures DENTAL UNITS with Position Technology that are more accurately referred to as dental treatment tables. In Western culture beds are in bedrooms and in-patient hospital rooms. Exam/treatment tables are in clinics and operating rooms. Dental tables are most ergonomic for dentists, hygienists, and dental assistants.